Skin cancer is a disease in which rapidly multiplying abnormal cells (cancer cells) are found in the outer layers of the skin. In 1985, former president Ronald Reagan had a growth called a basal (BAY-zuhl) cell carcinoma removed from the side of his nose. The president had often been described as looking tanned and healthy, and when the news broke, it raised public awareness of skin cancer and the dangers of overexposure to the sun. Each year, about one million Americans will be diagnosed with skin cancer. Melanoma (left) is less common tha-n basal cell carcinoma (right) but it is far more aggressive. Left: ©James Stevenson, Science Photo Library/Photo Researchers, Inc. Right: © M Abbey/Photo Researchers, Inc. Healthy skin cells protect the body (left), but cancer cells grow and divide uncontrollably (right), crowding out the healthy cells nearby. Melanoma is particularly dangerous because it can spread throughout the body. The skin often is called the largest organ of the body. It protects people by keeping water and other fluids inside the body, by helping to regulate body temperature, by manufacturing Vitamin D, and by performing a range of other complex functions. The skin also is a critically important barrier between people and such foreign invaders as bacteria. The skin is very personal: it is the first part of the body that people present to the world. Skin cancer is the most common of all cancers. It accounts for 50 percent of all cases of cancer. 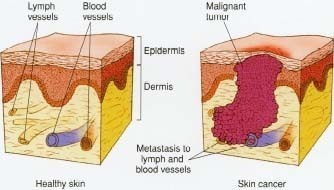 Cancers of the skin are divided into two general types: melanoma (mel-a-NO-ma) and nonmelanoma skin cancers. Nonmelanoma skin cancers are the most common cancers of the skin. They are also the most curable. Melanoma is much less common than nonmelanoma skin cancers, but it is far more aggressive and it is often lethal. The outer layer of the skin is called the epidermis (ep-i-DER-mis). It consists of layers of flat, scaly cells called squamous (SQUAY-muss) cells, under which are round cells called basal cells. The deepest part of the epidermis consists of melanocytes (MEL-a-no-sites), which are the cells that give skin its color. Melanoma begins in the melanocytes. The two main types of nonmelanoma skin cancers are basal cell carcinoma and squamous cell carcinoma. These cancers develop in different layers of the skin, but they both appear more commonly on sun-exposed areas of the body. Squamous cell carcinomas grow more quickly than basal cell carcinomas. Skin cancer begins with damage to the DNA of the cells in skin. DNA is information we inherit from our parents that tells the cells of the body how to perform all the activities needed for life. DNA is contained in genes, and each cell has an identical set of genes. Some of these genes carefully control when cells grow, divide, and die. If a gene is damaged, the cell receives the wrong instructions, or no instructions at all. When that happens, the cell can begin to grow and divide uncontrollably, forming an unruly cluster that crowds out its neighbors and forms a cancerous growth, or tumor. Melanoma is potentially a serious cancer because it has the ability to spread to other places in the body. Nonmelanoma skin cancers, however, tend to stay put and are less likely to spread. Certain kinds of risk factors suggest who might be likely to develop cancer. A risk factor is anything that increases a person's chances of getting a disease like skin cancer. One risk factor is having certain types of moles. Another risk factor is having fair skin. The risk of melanoma is about 20 times higher for light-skinned people than it is for dark-skinned people. But dark-skinned people still can get melanoma. A person's chances of getting melanoma are greater if one or more close relatives have gotten it. People who have been treated with medicines that suppress the immune system (the body's defenses against infection) have an increased risk of developing melanoma. Exposure to ultraviolet radiation—for example, sunlight, tanning lamps, and tanning booths—also is a risk factor for melanoma. Most nonmelanoma skin cancers are caused by unprotected exposure of the area that has the cancer to ultraviolet radiation. Most of this radiation comes from sunlight, but it may also come from artificial sources. Although children and young adults usually do not get skin cancer, they may get a lot of exposure to the sun that could result in cancer later on. Other risk factors for nonmelanoma skin cancers include having fair skin, and having a weakened immune system as a result of medical treatment for other conditions. In addition, exposure to certain kinds of chemicals increases a person's risk of getting nonmelanoma skin cancers. Melanoma may show up as a change in the size, color, texture, or shape of a mole or other darkly pigmented area. Bleeding from a mole that is not the result of a scratch or other injury may also be a warning sign of cancer. Nonmelanoma skin cancers can be hard to tell from normal skin. The most important warning signs are a new growth, a spot or bump that seems to be growing larger (over a few months or a year or two), or a sore that does not heal within three months. border with ragged, blurred, or irregular shape. diameter greaterthan 6 millimeters (size of a pencil eraser). Moles that match any of the ABCDs should be seen by a doctor. When either a melanoma or a nonmelanoma skin cancer is suspected, the doctor will take a special sample of skin (a biopsy) from the abnormal area for examination under the microscope. The first step in treating skin cancer is to stage it, that is, to decide whether and how far it might have spread. Staging a cancer is an important step in deciding what the best treatment for the patient is. It also helps to determine the patient's prognosis (outlook for survival). The most common system used to stage skin cancers assigns a Roman numeral from 0 to IV to the cancer. So, for example, stage 0 means the cancer has not spread beyond the tissue beneath the skin; stage IV means that the cancer has spread to other organs such as the lung, liver, or brain, and is less likely to be curable. Fortunately, most nonmelanoma skin cancers can be completely cured by a variety of types of surgery depending on the size of the cancer and where it is. If a squamous cell cancer appears to have a high risk of spreading, surgery may sometimes be followed by radiation or chemotherapy (kee-mo-THER-a-pee). Chemotherapy refers to the use of anticancer drugs that can be injected into a vein in the arm or taken as tablets. In some precancerous conditions, chemotherapy may simply be placed directly on the skin as a cream. Treatment for melanoma includes surgery and chemotherapy. Radiation therapy (which uses high-energy rays to kill cancer cells) is not usually used to treat the original melanoma that developed on the skin. To Prevent Skin Cancer, Slip! Slap! Slop! A popular anti-skin cancer slogan in Australia goes, "Slip on a shirt! Slap on a hat! Slop on some sunscreen! Seek shade!" The most important way of lowering the risk of nonmelanoma skin cancer is to stay out of the sun. This is especially important in the middle of the day, when sunlight is the most intense. Because no one wants to stay indoors all day, children and adults can protect their skin by covering it with clothing and by using a sunscreen with an SPF factor of 15 or more on areas of the skin exposed to the sun. Wide-brimmed hats and wrap-around sunglasses with 99 to 100 percent ultraviolet absorption help to protect the eyes. Tanning booths should be avoided. What Is New in Skin Cancer Research? Scientists have made enormous progress in understanding how ultraviolet light damages DNA and how DNA changes cause normal skin cells to become cancerous. In addition, researchers are looking into ways of treating skin cancers by enlisting the patient's immune system (the body's defenses against tumors and infection) to fight cancer cells. Long-term exposure to the ultraviolet (UV) rays of the sun damages the body's skin cells and can lead to cancer. For example, repeated sunburn and tanning cause the skin to wrinkle and to lose its ability to hold its shape. Dark patches called lentigos (len-TEE-goes) (age spots or liver spots) may appear, along with scaly precancerous growths and actual skin cancers. The sun's UV radiation also increases a person's risk of developing eye problems, including cataracts, which can cause blindness. Burning and peeling are signs that a person's skin has been damaged. The sun can also damage the DNA of cells, and if a person is exposed to the sun (or other forms of UV light) over many years, skin cancer may result. it means the glasses block at least 99 percent of UV rays. Whether the glasses are dark or light does not matter. The protection comes from an invisible chemical that is applied to the lenses. Any type of eyewear can be treated to make it UV-absorbant. A new type of treatment being studied called photodynamic (fo-to-dy-NAM-ik) therapy treats tumor cells with a special chemical that makes them sensitive and then shines a laser light on them, which kills them. Drugs related to vitamin A are being studied for use with some skin cancers. But the treatment has side effects, and its benefits have not been conclusively demonstrated. Researchers studying melanoma in particular are experimenting with adding genes to cancer cells to make them more sensitive to drugs, to replace damaged genes, or to encourage the immune system to attack the abnormal cells. The most important thing to remember about skin cancer is that most of it is preventable. It is never too late for people to begin to protect their skin. Because a person who has had one skin cancer is at risk for another one, monthly self-examinations should become part of a routine. Cancer is most likely to recur (that is, to come back) in the first five years after treatment. A person who loves being in the sun will have to adjust to a life without sun worshipping. But except for staying out of the sun, almost everyone with skin cancer can go back to the life they had before they got cancer. Murphy, Gerald P., et al. Informed Decisions: The Complete Book of Cancer Diagnosis, Treatment, and Recovery. New York: Viking, 1997. Poole, Catherine M., and Guerry DuPont IV. Melanoma: Prevention, Detection, and Treatment. New Haven, CT: Yale University Press, 1998. U.S. National Cancer Institute (NCI), Bethesda, MD 20892. NCI coordinates the government's cancer research programs and clinical trials. Its website posts What You Need to Know About fact sheets for skin cancer, melanoma, and moles and dysplastic nevi. American Academy of Dermatology, 930 N. Meacham Road, Schaumberg, IL 60173. Provides information about the science and medicine of the skin. American Cancer Society (ACS), 1599 Clifton Road N.E., Atlanta, GA 30329-4251. ACS has resource centers at its website for melanoma and nonmelanoma skin cancer. OncoLink. The University of Pennsylvania's Cancer Center Web site. A valuable store of information for patients about all aspects of cancer.